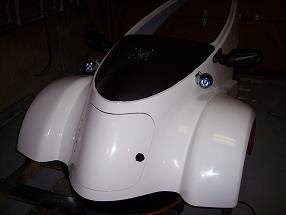 BugE - More than a bike, less than a car: Mirrors, headlights & front storage area door. Since the cowl is not mounted to the bug yet, this is a good time to do some little things that will be harder to do once it is mounted to the pivot tube. The biggest cosmetic change to the 12v system of the BugE is the addition of lighted mirrors. I found some really nice looking EuroSport side mirrors from AutoAnyting.com for arund $18 ea. This model is adjustable so it can be used on either the right or left side. In the photos I've seen on other BugE cars, the mirrors appear to be placed parallel to the lip of the cowl and line up about where the console begins. Since these mirrors are lighted, they have been placed forward about an inch so power wires can pass from them. As you can see, the mirrors came with spare bulbs and some sheet metal screws. However, I've decided to use some small machine screws instead so the fiber glass is not stressed out as much. When I need to replace the bulbs, this photo reminder will hopefully remind me to press in the two catches on the right side rather than trying to pry off the front. Since the mirrors look so much like they are integrated into the bug, I'm going to try to use the lighted mirrors as primary turn signals. 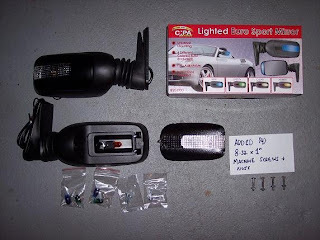 If the lights don't seem bright enough or they don't pass inspection, then I'll be using the small Targa lights that came with the BlueSky kit in the front too. POST CONSTRUCTION OBSERVATION: February 14, 2009 - Found the Eurosport mirror turn indicators LOOK nice from the front. However, the mirrors need to be angled up since the body mount point is too low. Even when this is done, visibility is rather restrictive. I have replaced the Eurosport mirrors with Izuzu pickup truck mirrors. I also installed a separate DOT approved turn signal pair since the new mirrors do not have turn signal lamps built into them. Now, it's time to attach the storage door to the body. Originally, I bought some cabinet hinges to do that. However, I could not make them work for me. So, rather than making a special trip to the hardware store just for a pair of hinges, I decided to make my own offset hinge assembly. Upper-Left shows the materials. Some washers that fit #8 screws, (4) 8-32 - 1/2" screws (note: 8-32 1/2" screws should be flat head white 8-32 screws but I used zinc round head because that's what I had on hand at the moment), (8) 8-32 nuts, (2) two inch gate hinges, some counter edging (used about 8" of it) and some stubby flat-head self-tapping screws with big threads. Top-Middle The next step was making some notches in the BugE door lip. For marking, I used a hinge as a guide, a pencil to mark and a dremil for cutting. Top-Left Using a Dremil, I removed about an 1/8" of material from one end of the door so it could go over the hinges when opened. Middle-Left Where to put the holes? Door holes were based on holes in the hinges. Image shows screws drilled through cover and attached with nuts inside. The inside nuts not only secure the screws, but also serve as spacers. 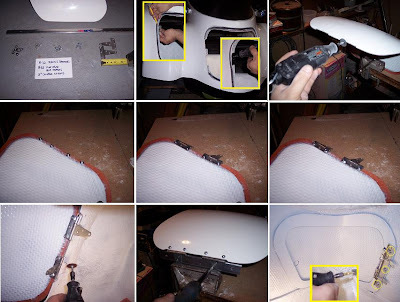 Middle-Middle Image shows hinges being put on. Note, spacer nuts are left on. Middle-right Image shows securing nuts attached to top of hinge. Lower-left Fiberglass material is removed using a dremil in the approximate size and the thickness of each hinge. Lower-middle An 8" piece of counter edging is attached to the hinges with some stubby flat head self-tapping screws. The screw heads mount to the edging such that no screw head is visible. While inside the storage area drilling holes, I also marked the location of where the door catch mechanism should go. Once I finished mounting the hinge, I opened the door, drilled a small starter hole from inside to out. Then drilled a hole using a 1" hole saw from outside to in. Then added the included tang and the door is done! Tools - Drill (with drill bit kit), 1" hole saw, Dremil (with cutting bit & drill bit) , Shop light, respirator (for fine fiberglass particles), safety glasses, screw driver, adjustable wrench, pencil, marker, metal ruler, wood vice. Time used - about 8 hours working casually, 4 hours blogging about it. Lots of assembly time (maybe too much) is spent thinking about how best to record what I'm doing in digital format. Straight assembly should go much faster - especially if the correct parts are used. I'm sure next time I go to the hardware store, I'll see some cabinet hinges that would have been PERFECT to use instead of doing it the roundabout way I just did! Hey, but that's what this project is about. LEARNING! Hot-glue some new weatherstrip around the door since I wrecked the stripping that was originally on the door. Replace the shiny roundhead screws visible on the outside of the door with white flathead countersunk screws.